This article is part of a year-long feature - watching and blogging about twenty acclaimed, cult, challenging and rare films over the course of 2013. The full list of films (and links to other completed posts) can be found here. Oh, we're half way there! 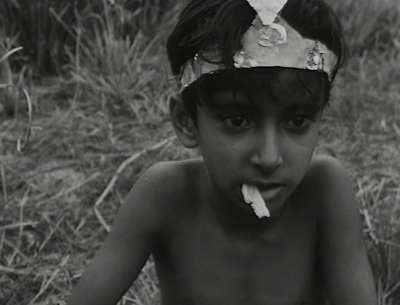 Diving into the world of Pather Panchali and, because they're so interconnected, two unexpected bonus films: the continuing adventures of a boy called Apu in Aparajito and World of Apu. To say my knowledge of Indian cinema is limited is a serious understatement - my knowledge basically amounting to stereotypes perpetuated by Western media. There's no doubt that a sharp cultural divide exists, and that the Bollywood industry is built on basic, endlessly repeated formula - but there are without question great films out there that I have simply never been inclined to seek out. That, up until now, included the work of Satayajit Ray - pretty much the uncontested auteur laureate of Indian (or specifically Bengal) filmmaking. The man earned the undying respect of everyone from Kurosawa to Scorsese - honestly, I'm a little ashamed I didn't get around to his films earlier. It's probably not exaggerating to call his debut Pather Panchali the most famous and beloved film to ever emerge from India. Telling the story of one poor family in a rural village, Ray focuses on the viewpoint of young Apu. It's a simple but emotionally generous representation of childhood - bringing us on a rollercoaster from pure, innocent joy to the various confusions caused by challenges and tragedies beyond his young comprehension. The sequels take us further - Aparajito a tale of adolescence, World of Apu showing our protagonist adjusting to the harshness of adulthood. What's most striking about the films is their absolute lack of pretension. The first two films - Ray's debut features - are very much the product of limited resources: the pacing is occasionally unwieldy, the editing and camerawork accomplished if a tad clunky. The third film, coming after the international success of its predecessors, is a more traditionally 'complete' work - not necessarily better (they all operate on a consistently high quality plain), but certainly more confidently composed, more lavish in its production values. Yet throughout the entire trilogy, there is a razor-sharp focus, an ambition to tell a deeply human tale without extraneous or distracting material. It's also a real pleasure to see such a story told in a country rarely given raw Western cinematic attention - from the city chapters to the quieter rural ones, there's no shortage of fascinating insights into the mid-century customs and culture of India (including the most casually sudden wedding most Western viewers are likely to discover). 'Human' is a key word here - we're offered an emotional buffet. The films range from subtle observations to tragic melodrama, but even during the heightened dramatics Ray has absolute sympathy for his characters. Apu (played by four different actors over the course of the films, and there might be an infant player too) is led through a string of tragedies - the films put together offer a higher mortality rate than many slasher films - but also great heights of ecstasy, and we're privileged to be able to join him on his journey. Above all, there's a curiosity about Apu: our hero eager to discover and learn from the world around him - whether that's the sight of a locomotive (barreling trains being one of the most recurrent images throughout the cycle), the wonders of a book or his first altogether baffling encounter with genuine love. All the actors manage to portray this with great skill - from the kids to the superb Soumitra Chatterjee as adult Apu - and when Ray zooms into their eyes, they are full of awe, sometimes uncomfortably emotive. Again, Ray mostly resists showing-off. Granted, each film offers a beautiful, exciting and prominent soundtrack from composer Ravi Shankar. And there are the handful of elaborate, memorable visual setpieces - perhaps most unforgettably Apu's first encounter with a train in a wild white field. But the films' most consistent stylistic indulgence is admirable for its glorious simplicity. Very often, Ray and his cinematographer Subrata Mitra will simply point their camera at nature - a swarm of insects, a lively pond, a swaying tree. These energetic images often contrast directly with the narrative happenings. Apu loses his sister, mother, father and wife, but the world's always buzzing, and the recurrent visual signature of nature is one of careful optimism. These films are alive, and the tragedies always part of a wider emotional cycle Apu himself is forced to navigate. 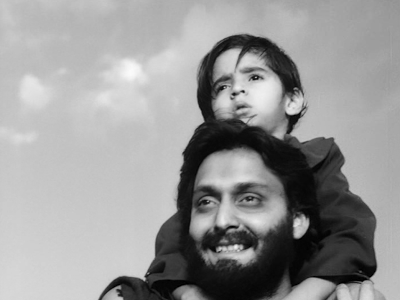 Death in the Apu trilogy is always countered by images of a world overflowing with life. Apu, like many of the most compelling screen creations (albeit in this case one based on a literary source), is a flawed protagonist. In the second film, his natural teenage selfishness means he misses the obvious signs of his mother's loneliness and deteriorating health. In World of Apu, the promising, prodigious child of Pather Panchali and Aparajito is partially consumed by apathy and laziness. But like the way Ray is clearly growing more intrigued in the stylistic and storytelling possibilities of cinema as the films progress, Apu has an innate curiosity about the world around him. It's that simple and most human of traits that lend the films some of their deeper emotional depths and ultimately ensures a hard-won hopeful conclusion. At trilogy's end, Apu is reunited with his estranged son. Together they walk towards the city and adventure. Ray draws a close to Apu's cinematic journey with father and son excited about the path ahead. And, right until the end, as they literally beam with happiness, there's a powerful, exhilarating curiosity in their eyes.